I don’t mean that much can be explained. I offer a few lines of my favorite Objectivist poet advisedly – in these few lines I find as fine a distillation of what composer Laurence Crane is up to in this generous and overdue constellation of chamber works as any I might manage. These 20-odd pieces are kindled with an adamantine clarity and transparency, the sort of blue fire rarely heard in contemporary composition outside of the Wandelweiser collective. But then there is Oppen’s last admonitory line, and its aptness to Crane’s work is perfect -anyone who is struck, as I was immediately upon hearing my first Crane composition last year, by the embarrassment of harmonic beauty and architectural rigor throughout these works, will soon sense another, recondite quality to the music. Composer Michael Pisaro refers to this quality as “quietly crazy”, owning a beauty that is “hermetic” and “fragile.” Contained within Crane’s elemental materials there is much that cannot be explained, something necessitating that I use that often inappositely used word, ineffable. I find the suchness of Crane’s music eludes explanation despite immersion and repetition; this is unusual in my experience. However much I might welter and flail when setting out to write about many of Crane’s contemporaries, there eventually comes some sort of hook on which to hang a few ideas. I have lost track of how many times I have heard these mainly miniature-scaled pieces, and yet I cannot tell you precisely why I agree with Pisaro that this is music at once subversive and ordinary, recalcitrant and inviting, frugal, even abstemious, yet sounding like a gift offering generous clarity and transparence. Experienced this way, Crane’s compositions are koans, another model of concision and clarity, where both conceptual rigor and poesy rule, contradictions and dualities obtain, and the listener, confronted with all this, is invited to, essentially, get over it. The chamber works are not without occasionally distinct referents, even seeming melodic and harmonic echoes, however transitory – I hear Feldman, Satie, Peter Garland, Thomas de Hartmann’s Gurdjieff works, reaching way back, Early Music, and, most saliently, Howard Skempton, who inspired Crane to compose music based in tonality. His transparence, to return to one of Oppen’s bare-bone qualities, is manifested in these intermittent evocations of his predecessors. “I take to my room and let small things evolve slowly,” Satie said. Crane has done so as well, outside of any spotlight, with only a few available releases of his work, prior to this one. Crane is most rigorous in subtracting any elements in a piece that might obstruct the direct experience of the ineffable; in this way his music owns a humility that brings to mind for me Jurg Frey, whom Crane apparently admires a great deal. There is humility in how improbably patient Crane is in his rhythmic and harmonic development. There is humility in the melding of sly humor and rigorous beauty, especially in the piano works. 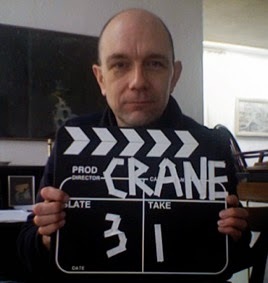 There is humility in Crane’s fealty to the most basic elements of composition, coupled with their raw and rigorous repurposing, that has clarified his work since at least 1992. It was in 1995 that Crane began his association with the ensemble Apartment House, whose core members are heard on this recording. For all I have said about the ineffable nature of this music, a few meat-and-potato observations: Crane likes the clarinet – only five of the pieces in this collection are sans clarinet, three of those being for other solo instrumentation (piano, cello and electric guitar, respectively); Crane likes Andrew Sparling on the clarinet – the pieces bearing his name, Sparling (two iterations) and Sparling 2000, serve beautifully as a spine for the first disc - they are programmed at the beginning, middle, and second-to-last place on disc one, the clarinet sounding a sort of simple dawn chorus, with each iteration shaded and colored variously by Sparling’s accompanists; there is no fast music; Crane, like Satie and Feldman, enjoys a wacky song title, e.g., I Saw Alexander Bălănescu In Safeways; and, as I have said, Crane holds a long, loving regard for the first principles of tonal music. What can I add to clarify how I hear the unwonted beauty of Crane’s work found here? I heartily recommend, of course, that you live with it a while, available to the koan encased in its simple attractions. Crane’s chamber works, stripped bare and being of two realms – the implacably logical and the ineffable – endlessly moves these two realms close together and far apart, music at once clear, transparent, explaining nothing. This is a remarkable achievement, and my thanks goes to the Apartment House ensemble for its impeccable musicianship, Another Timbre’s Simon Reynell for his patient work in bringing this release to fruition, and, of course, to Laurence Crane, whose music has been an environment I have spent considerable time in lately, one that has changed me.